At least 10% of the proceeds of all image sales are donated to charities dedicated to the causes of environmental protection and/or animal advocacy. 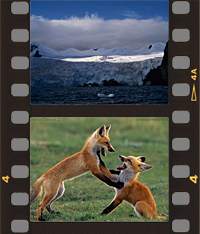 The photo files at Never Spook the Animals Wildlife Photography contain tens of thousands of quality images available for licensed use in publications, advertising or web designs. The species and locations we have on file are indexed in the Stock List. Sample images are displayed in the Portfolios. Unless otherwise specified, licensed images are supplied as unsharpened, 8-bit TIFF files in Adobe RGB (1998) colour space. Scans from slides are approximately 50 MB; digital captures, approximately 25 MB or larger at native resolution. Detailed captions are embedded within all images. Text-image packages suitable for publication as magazine articles may also be available upon request. Please contact us to discuss your specific needs and requirements at info@neverspook.com. All images displayed on this website (as well as many of the subjects on the Stock List) are available for purchase as fine art photographic display prints. Each individual print is carefully created by the photographer from the original image using digital printing technology for high quality photographic reproduction and long-term image stability. Unless you specify otherwise, images up to 12"X18" will be printed on Ilford Galerie Smooth Pearl Paper; larger images, on Epson Premium Luster or Semimatte Photo Paper. All images will be printed using Epson archival quality Ultrachrome K3 pigment-based inks. Other sizes Please contact for details. Payment is accepted by check or money order only. The above prices do NOT include shipping costs or applicable taxes. Images can be shipped anywhere in the world - small prints are packed flat; larger prints, in a tube. Orders are printed and shipped as promptly as possible, usually within two weeks of receipt of payment unless we are away on an extended photo shoot. You will be given an estimated delivery time for your print when your order is received. All images come with a money back guarantee. If you are not completely satisfied with your print, just return it within 30 days of receipt for a full refund (exclusive of shipping costs). To place your print order, please contact us at info@neverspook.com.